Policy changes include all mail-in ballots and runoffs between the top two candidates. Hawaii’s democracy is broken. It has been the honor of a lifetime to serve in elected office here in Hawaii, and I am therefore deeply troubled by the increasing lack of voter participation and competitive elections in our community. Hawaii has the lowest voter participation rate in the United States because we lack competitive elections. Of the major statewide and congressional races in the last election, none were competitive and nearly two-thirds of the legislative seats lacked a general election race because of no opposition. This lack of competition in Hawaii’s elections threatens the vitality of our democracy and makes our Aloha State electoral system look more like the “democracies” in Kazakhstan or Venezuela than the United States. This is a crisis that demands attention. The failure of civic engagement in Hawaii is making our government no longer a government of the people, by the people and for the people, but a government of the few, by the few and for the few. Those who value democracy must care about reforming this hollow system. There are six clear policy changes that will address this urgent crisis in Hawaii elections. No. 1 Top-Two Elections. Hawaii should join California, Louisiana and Washington as well as our local county governments in going to a top-two election system. All candidates should run together in the primary, regardless of political partisanship. If any candidate obtains more than 50 percent of the vote in the primary, he or she is declared the winner. If no candidate receives more than 50 percent of the vote, then the top two candidates advance to the general election, even if they are of the same political party. This system works well in the heavily Democratic state of California as well as the heavily Republican state of Louisiana. It is time for Hawaii to join them. 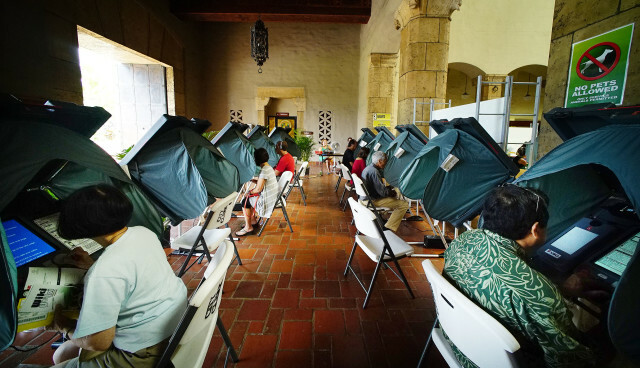 Early Voting electronic voting machines Honolulu Hale, August 2016. The author has policy suggestions to fix what he calls our broken political system. No. 2 All Mail-In Ballots. We need to end the 18th-century system of election-day balloting. Instead, Hawaii should join Colorado, Oregon and Washington and move toward a 100 percent percent mail-in balloting system where all registered voters are mailed a ballot to be returned by election day. By making voting more convenient — eliminating the long lines at polling locations, the difficulty in determining the correct polling location and the inconvenience of having to take time off from work to cast a vote — we can encourage more voter participation. This policy has the added benefit of being less expensive than our current antiquated election system. No. 3 Establish Quarterly Contribution Reporting. To increase transparency, Hawaii’s campaign contribution system should require any candidate, as well as any super-PAC or special interest group that spends over $25,000 in an election cycle, to report his or her contributors and expenditures quarterly rather than bi-annually. Too much of Hawaii’s politics is clouded in obscure, dark donations that only come to light at the last minute. I advocate reporting campaign donations and expenditures on a quarterly basis. No. 4 “None Of The Above” Ballot Option. Hawaii should follow Nevada’s lead allowing for a “none of these candidates” voting option. Although this rarely alters the outcome of any race, it gives the people more control and choice in their vote. It sends a signal to the politicians in office, even when running unopposed, that the people may not be satisfied with their performance in office. The power of voting should always rest with the people and an option such as this helps effectuate true voting power. No. 5 Allow Only Individual Contributions. Big money from big organizations skews the competitive dynamic of a democracy. That’s why direct corporate and union donations are prohibited in all federal elections and in most states. It is time for Hawaii to conform with the federal rules that have already been in place for decades and limit candidates to accepting contributions only from individuals. If a donation is not coming from an actual human being, candidates should not be allowed to accept it. No. 6 Let Gubernatorial Candidates Select Running Mates. At the presidential level, the party nominee selects his or her vice-presidential running mate. This system has been adopted for governor and lieutenant governor positions in 18 states including Minnesota, Montana and Utah. The time has come for Hawaii to do the same. I further propose setting the lieutenant governor’s salary the same as the salary for a state senator, but allow the governor to appoint the lieutenant governor to a cabinet position and lead a department with the pay of a cabinet member. New Jersey has adopted this system. These proposals for reform will go a long way to fix the terrible scoliosis that permeates Hawaii’s elections, and have all been vetted and enacted in some form in other states. I urge the new Hawaii Legislature to examine and adopt these proposals to build a more open, trustworthy system of government. Charles Djou is a former U.S. congressman, Honolulu City Councilman and Hawaii state Representative who currently serves as a lieutenant colonel in the U.S. Army Reserve.